Michael Monroe joined Metallica’s Robert Trujillo and Kirk Hammett for a performance of his 1989 single, “Dead, Jail Or Rock 'N' Roll", at the Hartwall Arena in Helsinki, Finland on May 9, and the band are streaming professional video from the event. The tune, which appeared on the Hanoi Rocks’ singer’s second solo record, “Not Fakin’ It”, made headlines when it was originally issued with an accompanying video that featured Guns N’ Roses singer Axl Rose and secured rotation on MTV back in the day. 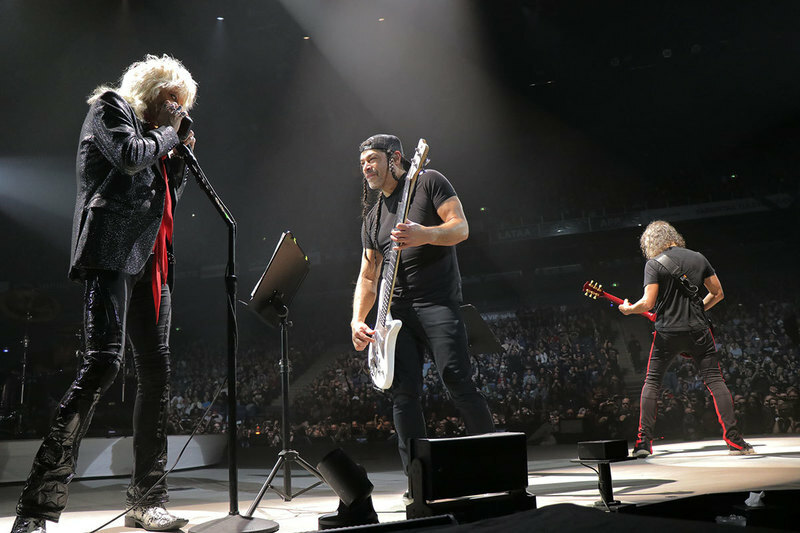 The May 9 stop in Helsinki is the first of two dates in the city, as Metallica prepare to wrap up their current arena tour of Europe with another show at the same venue on May 11. Metallica will enjoy a break from their WorldWired tour in support of “Hardwired…To Self-Destruct” this summer before launching a North American arena run this fall.